A leading supplier of pop-up bar and premium drinks services has appointed three new members of staff and made one internal promotion to support rapid business growth and development. 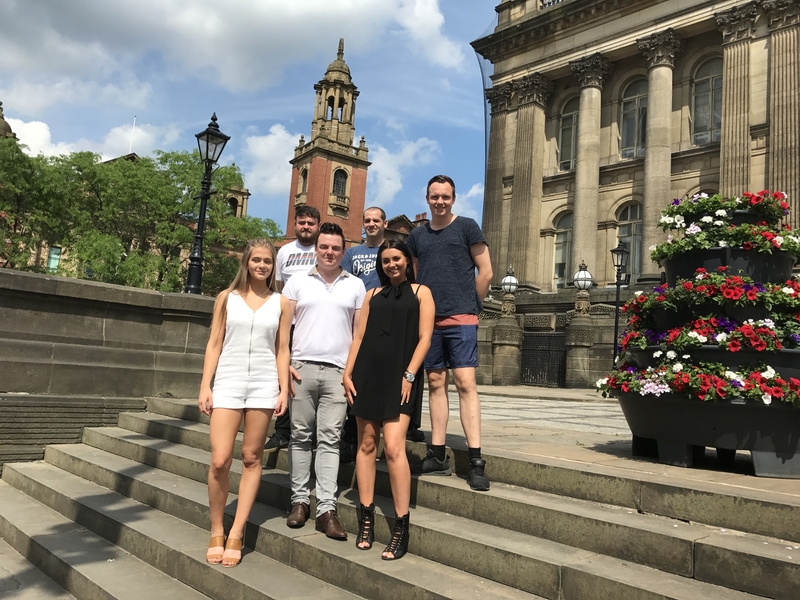 The appointments come after a series of account wins for Leeds-based Zest Mixology, who recently secured a contract with Amadeus, the contract caterers for the National Exhibition Centre (NEC). Newly appointed events administrator, Charlotte Taylor will ensure the smooth running of both private and corporate events whilst studying for a bachelor’s degree in Events Management at Leeds Beckett University. Emily Ratcliffe, who previously assumed the role, has now progressed to account manager and will be responsible for a number of key accounts, whilst taking a lead on marketing activity and proactively seeking out new business opportunities for Zest Mixology. Ben Shimmin, who recently graduated from Leeds Beckett University with an upper second-class honours in events management, joins the business as an events specialist. Ben will ensure the team continues to deliver high quality bespoke bar solutions, whilst acting as a lead team member at Zest Mixology’s events. Steven Glynn has been recruited as warehouse manager and will be accountable for the smooth running of the warehouse, in line with their recent accreditation with the Sustainable Events Alliance. Having experienced double-digit growth every year since inception, the new appointments come at a key time for Zest Mixology who also recently opened a London-based warehouse operation to better service clients across the South of England. “I am delighted to welcome three talented and skilled individuals to the team at Zest Mixology. I have no doubt that they will excel in their roles and I look forward to being able to support them in their careers and provide them with the necessary foundations for them forge successful futures for themselves. “It is also hugely rewarding to see our new account manager, Emily progress in her career with us and help her to build upon the skills she has already acquired in the events industry. We are building a strong team at Zest Mixology, enabling us to continue to deliver clients with outstanding levels of support as we grow”. With a recent scale-up loan of £80,000 secured from HSBC, the business is set to double in size over the next 12 months and employ a further five people over the next 24 months. About Zest Mixology Zest Mixology is a first-class mobile drinks service that was founded in 2011 by Murdo MacLeod. The company delivers nationwide service for a broad range of events. Since the company’s initial inception, it boasts an impressive 30% year-on- year growth with 10% net profit. This year alone, the mixologists are set to turnover more than £400,000. Zest Mixology consists of a Managing Director, office manager and two experienced events specialists which ensure a consistent and professional service. From outsourced HR company, DLP, the firm has access to over 1000 bar-tenders on their database which are always available to call for numerous events across the country. The company caters for a broad spectrum of events and has provided their services for a vast quantity of high profile names such as Apple, Microsoft, Hilton and Nescafe, as well as catering for well-known supermarket chains such as Tesco, Asda and Iceland. In the past five years alone, the Zest Mixology team has delivered services to 2500 events, both large and small. This has resulted in them being employed for an astounding fifty events a month. As their business has flourished, they have extended their geographical reach from as far as central Scotland down to the South of England. Zest hosts a diverse range of events including corporate functions, exhibitions, weddings, festivals and private parties. After being up and running for half a decade, the company have thrived by extending their services to villas, yachts and parties in Ibiza and mainland Europe also. A market leader, the growing company provides customers with different types of bars, a team of award-winning cocktail mixologists and waiting staff. They also supply their clients with excellent quality furniture and beautifully-crafted glassware. Zest Mixology aims to excel every time, going above and beyond what is expected of them. The leading-market company also operate a national team for Funkin Purees, providing and equipping trainees with excellent skills, educating them about the industry with a broad range of techniques such as interactive training. Last year, Zest were the sole cocktail staffing supplier for MAMA group festivals, and Relentless Energy, whom they have been consultants for during the past three years. They cater for the brand by giving them an extensive range of cocktail options to choose from. These drinks are then served in numerous festivals throughout the year. This year, as the company goes from strength to strength, they intend to double the size of the business. They have hit the ground running this summer by supplying cocktail staff for 10 major UK festivals and providing the best quality VIP bars. Zest Mixology also employ staff that operate in existing bars, nightclubs and music/sporting venues - equipping clients with service that goes above and beyond the call of duty. See http://www.zestmixology.co.uk/ and for more information, contact Ellie MacDonald at MacComms on 07989 159138 / ellie@maccomms.net. © Copyright 2019. Zest Mixology .